This centrally located Nottingham city centre physiotherapy clinic shares the premises with a private doctors’ practice called Regent Street Clinic. 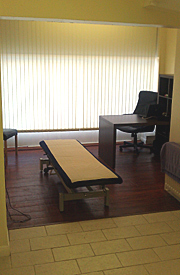 There are two treatment rooms and a comfortable reception area while you wait to be seen by the physiotherapist. There is disabled access to the rear of the building and easy access to the treatment rooms. Although there is no on-site parking at this clinic, on street parking is available, or a car park is in close proximity. PhysioDirect was established in 1999 with a single treatment room, we now have 11 clinics in a number of locations all over the Midlands and South Yorkshire. Whether you have a sports injury, a bad back or persistent aches and pains, we can help. 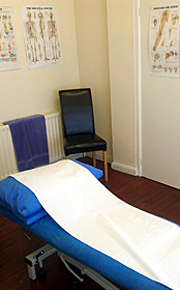 We also offer fully qualified, professional physiotherapy treatment in Derby city centre. Our team of Chartered and State Registered Physiotherapists are looking forward to providing you with a fast, efficient and helpful service. PhysioDirect treat all sports injuries, back pain and neck pain, as well as providing pre and post-op rehabilitation. Our team of Physiotherapists and Sports Massage Therapists are recognised by all major insurers and private health insurance companies. The clinic is located on Regent Street, just around the corner from Park Row and Cumberland Place. It is also just up from Browns Café and a short walk from Nottingham Playhouse. Access to the clinic can be gained from Main Marion Way or Via Derby Road (up past the Albert Hall) or via the Ropeway. In 2002 Kris suffered a fracture and dislocation to his right ankle, resulting in a week long stay on an orthopedic ward in Stoke on Trent, followed by extensive rehabilitation. This experience inspired him to study a degree in physiotherapy. He qualified as a physiotherapist in 2007 with a specific interest in manual musculoskeletal therapy. Previous to becoming a physiotherapist, Kris worked as a personal trainer focusing on obesity control, exercise performance and injury rehabilitation. He has also had experience developing and delivering national education programs in anatomy, physiology, rehabilitation and special populations care. His clinical training as a physiotherapist, coupled with his previous experience, has resulted in varied hands-on treatment approaches including biomechanical and exercise centered injury rehabilitation. Kris also works at our Derby Clinic. HPC Number: 84697. CSP: 082569.